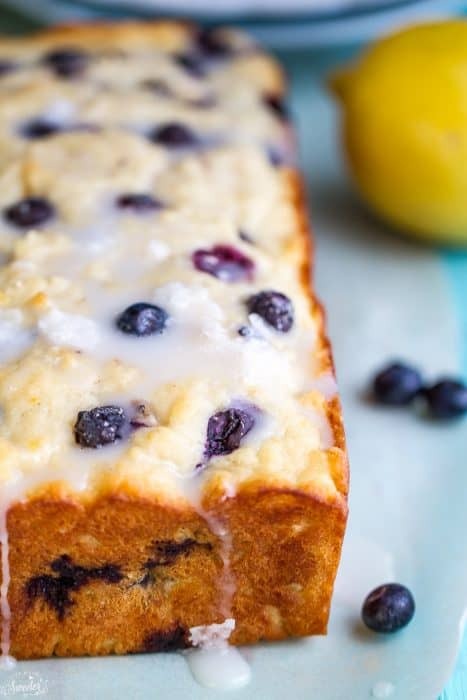 Perfectly soft Blueberry Lemon Loaf Cake – a tender and quick bread bursting with lemon flavor and loaded with plump and juicy blueberries. Summer is slowly winding down and we’ve been slightly obsessed with blueberries lately. They’re the best this time of year and when you toss them together with bright lemon and bake them up – it’s a classic combo that everyone loves. I made this Blueberry Lemon Loaf Cake for the summer afternoon tea party we threw back in June using my 9×5 loaf pan I received from KitchenAid and it was one of the first desserts to that disappeared. 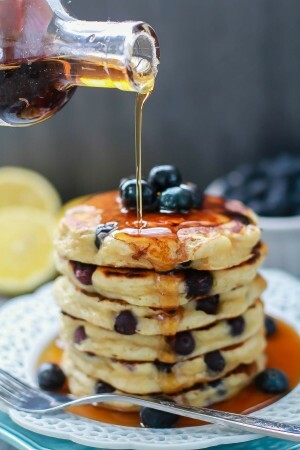 It’s incredibly tender, moist, and bursting with fresh blueberries and lemony goodness in every bite. This blueberry lemon loaf cake is an easy quick bread that whips up without having to use a mixer. There is NO butter and instead we use Greek yogurt and a little bit of coconut oil to create the extremely moist interior. The simple lemon glaze is completely optional but it does add an extra burst of lemon flavor that can’t be beat. It makes a delicious start to your morning and the perfect evening or after school snack. 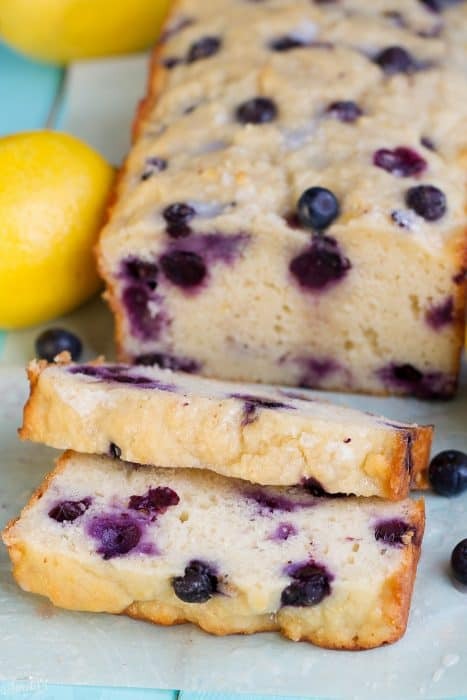 A tender and quick loaf bread bursting with lemon flavor and loaded with plump and juicy blueberries. It's quick and easy to make & the perfect pairing to your tea or coffee. In a large mixing bowl, whisk together flour, baking powder, and salt. Set aside. In another bowl, beat together the eggs and sugar. Slowly beat in vanilla extract, Greek yogurt, oil, lemon zest, and lemon juice. Combine the wet and dry ingredients using a spatula just until smooth. Be careful not to over-mix or the loaf will bake up tough. Pour batter into prepared loaf pan and bake in preheated oven for 50-55 minutes or until a wooden toothpick inserted into the center comes out clean. 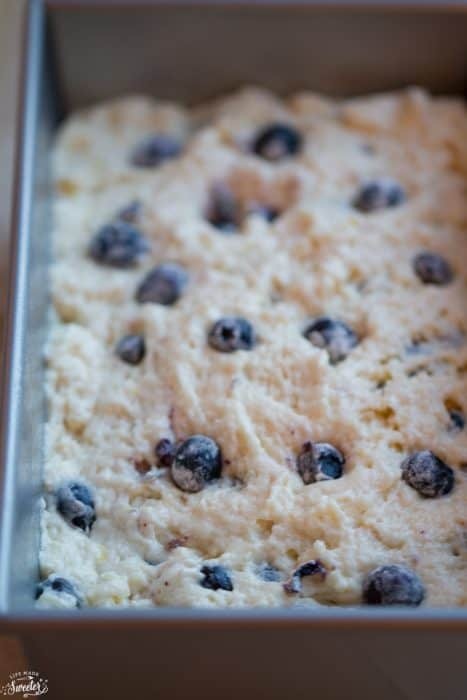 Remove from oven and allow to cool for about 10 minutes in the loaf pan. Remove from loaf pan and transfer to a wire rack to cool. Can serve alone warm or make the glaze. Meanwhile, whisk together the powdered sugar and lemon juice. Add more or less juice depending on how thick you want the glaze. Drizzle the glaze on top of cooled bread.